Akiane Kramarik believes that art has the ability to broaden one’s perspective and, within that, allows us to understand our own truths. How would you feel if your four-year-old child told you that they were having otherworldly visions on a regular basis? Visions that, without any influences from the outside world, your child transcribed onto canvas in a way that depicted the promise of heaven, love and hope? To dream imaginatively, without limitations, structure or preconceived notions, is a gift that, for many of us, has been relegated to our childhood. That sense of wonderment we had as children, the ability to imagine, to give voice to the creative spirits that live within us, to see what isn’t but imagine it’s real, is too often quieted by the expectations and responsibilities of adulthood. 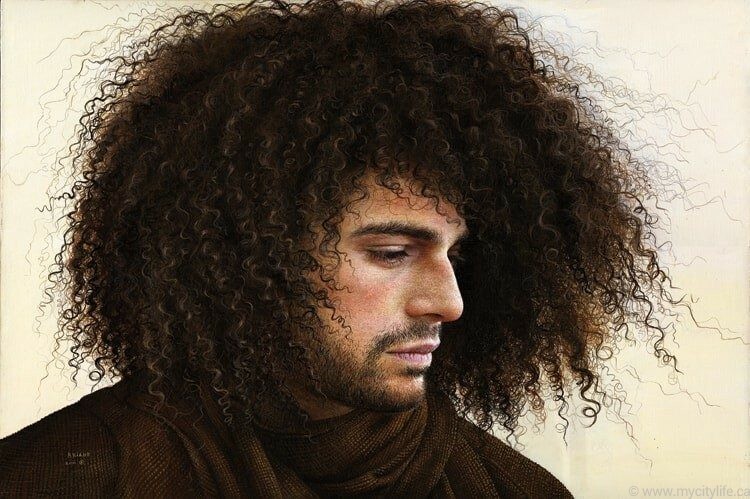 It is exactly this traditional imperative from society to leave childish things behind that makes the prolific and remarkable paintings and poetry of child prodigy Akiane (pronounced Ah-key-ahh-neh) Kramarik remarkable. Kramarik has been able to carry her sense of wonderment and childhood visions of creativity forward into adulthood, an extraordinary example of inspiration, fascination and influence. Kramarik, now 24, was born in the small rural town of Mount Morris, Ill., in a tiny shack that was often flooded. The third of five children and the only girl, Kramarik and her family were so poor that they would go door to door selling food in order to make money. Kramarik’s father, Mark, was a cook from the ghettos of Chicago, and her mom, Foreli, was an immigrant from Lithuania who successfully escaped the Soviet regime. “I grew up in a nurturing family, but my family did not believe in anything,” Kramarik says. The family had no television or radio, and were, at times, threatened by a neighbour because they didn’t attend the local church. Mark had become deathly ill from drinking water that had been poisoned, so Foreli started a home business to support their family while the older Kramarik siblings looked after their sister. Foreli became so successful that within a short period of time, the family was able to move to a 10,000-sq.-foot mansion in Missouri, with an indoor pool. The family created music from morning to night, and Kramarik considers these times some of her best memories. Each week, Kramarik would share the visions she was experiencing with her mom, who would listen intently, but say very little. However, as her young daughter showed her mother the drawings she was envisioning, Foreli slowly began to understand that what was happening to and with her daughter was profound and worth supporting. “My mom stood behind me through thick and thin. She was the first one to believe me and to share my story with the family,” Kramarik says. Foreli was so moved, in fact, that much to the family’s surprise, she quit her job to spend more time with Akiane, which ultimately brought the family to the brink of bankruptcy. When Kramarik was five, an extraordinary occurrence happened. She went missing for several hours, prompting a huge search and rescue mission. Then, just as suddenly as she had disappeared, she reappeared. “The place I was taken was not here on Earth,” Kramarik says. It is then that the artist started painting in pastels and would often stay up all night to create. When Kramarik was eight, she began getting up every morning at 4 a.m. to paint. One of her earlier childhood visions came back to her around this time, and she painted one of her (many) renowned canvases, Prince of Peace. It was an image that she once worked on for over 40 hours, cramping her hands to the point that she couldn’t move her fingers. Upon completion, the canvas was shipped to an art dealer for an exhibition but he promptly stole it. Utterly devastated and mired in pain, Kramarik did not find her beloved painting of Jesus until 12 years later, when she heard it was being stored in a vault by a collector who was not willing to show it or sell it to anyone. Starting with her charcoal sketches at the age of four, Kramarik, within a short period of time, was transcribing her complex visions onto canvas with pastels and acrylic paints. Her spiritual, God-driven paintings evolved at an astonishing, complex and multifaceted pace. Strength, a painting she crafted when she was seven, is an intricate and detailed portrait of a lion. 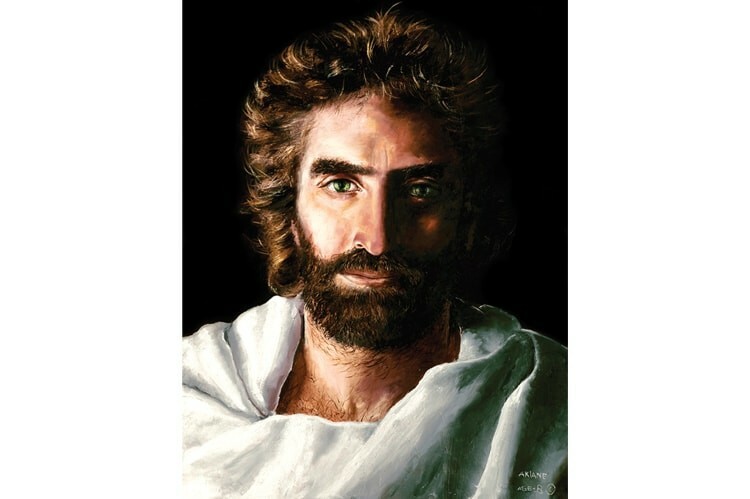 At eight, Kramarik painted the stunningly real portrait titled Prince of Peace. The image is painted with a shadowing effect that shrouds the subject in mystery. The Journey, painted when Kramarik was nine, is the portrait of an angel-dusted child smiling into the distance. Hope, Kramarik’s beautifully translated portrait of a child outlined by an arch of vibrantly purple-pink blooms, painted when the artist was 11, is a show-stopper. “The visions and dreams were very vivid and prolific during the first 10 years of my life,” Kramarik says. “Then, they decreased, but morphed into something different — into intense feelings and sounds.” Some of the paintings that Kramarik is most proud of include Today and Jesus, both painted when she was an adult, and Lilies of the Valley, painted when she was 20. Kramarik’s current portfolio embraces animals, nature and humans, in both a realistic and spiritual format. 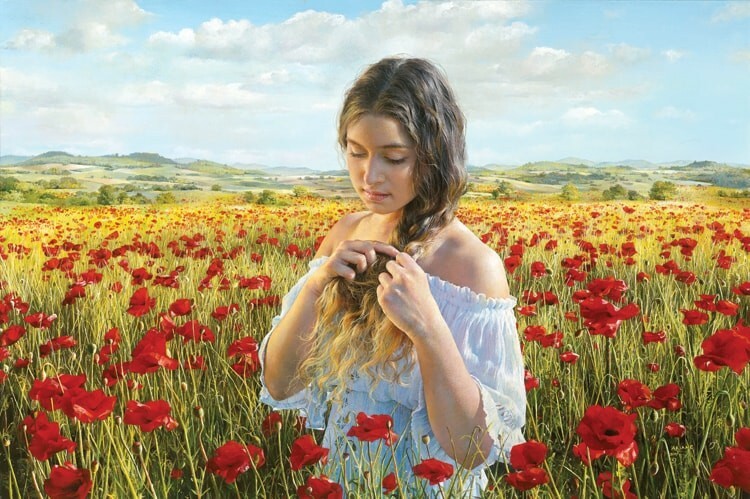 Periodically, Kramarik paints in a separate area of her studio, where she paints on small canvases — these are called Afternoon Art Series paintings. Kramarik has often been told that she has a universal library in her head. When she meets a person, she intuits hundreds and hundreds of ideas. Seeing the extraordinary in the mundane moments of life is a gift that Kramarik shares with the world through her paintings and poetry. Calling herself a visionary journalism artist, Kramarik is intrinsically focused on actualizing happiness by honouring the little moments in life, both with family and friends. Creating with her two hands also brings happiness to the artist, who is deeply honoured by the attention, praise and financial resources that her paintings provide. Author of two books — the first one a bestseller, which she wrote at 10 years of age (Akiane: Her Life, Her Art, Her Poetry, published by HarperCollins) — and with a third in the works, Kramarik holds triple residency/citizenship in America, Australia and Lithuania and speaks five languages: English, Lithuanian, Russian, American Sign Language and Japanese. 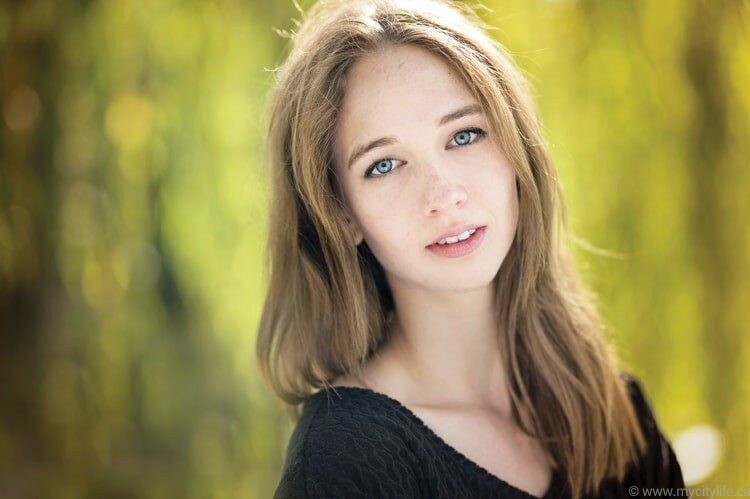 Interestingly, Kramarik’s deep commitment to her God-connection (she says that “spirituality is an energy we all have, like plants that need water”) has influenced her family to such an overwhelming degree that it has brought them to the practice of Christian faith. Kramarik’s ability to envision what isn’t and make it real through her poignant portraits of spiritual beings continues to be the transformative catalyst of hope that ignites her journey forward. At a time when people have to see it to believe it, a transparent faith completely contingent on tangible evidence, Kramarik’s all-encompassing and unshakeable faith that her purpose in life lies in transforming the heaven-sent messages she receives onto canvas is remarkable. “All these years God was waiting for me to grow so that I could fully understand and paint the most powerful message to mankind. The message of unwavering faith, unconditional love and eternal life,” Kramarik says.